When it comes to creating cycling friendly cities Northern European countries often reign supreme. 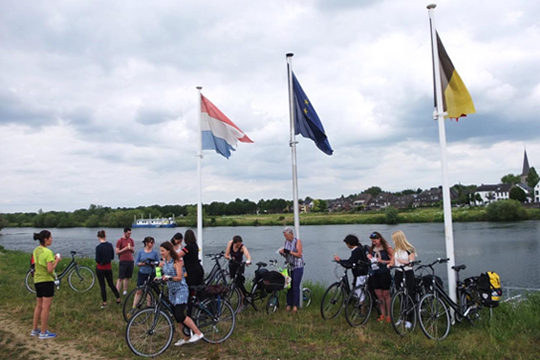 George Weeks, specialist urban designer with Auckland Council’s Design Office, recently spent his winter escape leading 12 people on a cycling study tour of Belgium and the Netherlands. In this two part series he shares his impressions of cycling on the other side of the world and explores some learnings for Auckland. It is a fact personally acknowledged that any urbanist will benefit from visiting examples of city planning and design (good or bad). Humans are empirical creatures and it is far easier to understand a place through a well-curated visit than it is from a week of reading reports. Through my volunteering with the Royal Town Planning Institute and Academy of Urbanism I have co-organised a number of cycling study tours. These have taken people to towns, cities and countries that are leading the way in designing for cycling as a mainstream mode of transport. Heading up the Zuid-Willemsvaart canal – there is little substitute for direct experience of what makes good or bad design work. On a recent holiday to the UK I joined the 2017 Young Urbanists’ study tour of Belgium and the Netherlands, an event I helped organise prior to my recent relocation to New Zealand. We planned to start early on a Friday morning with a tour of the Belgium city of Liège, this would be followed by an evening cycle across the Dutch border to Maastricht (30 km). The following day we would cycle to Eindhoven (85km), where we would spend two days exploring, before heading back to the UK. Leaving London St Pancras on a Thursday evening, a two hour Eurostar journey took us from London to Brussels. After about an hour (including a change of train) we pulled into Liège, third city of Belgium and a former powerhouse of steelmaking. Liège has the most spectacular railway station; a soaring cathedral of light built by Santiago Calatrava in 2009. 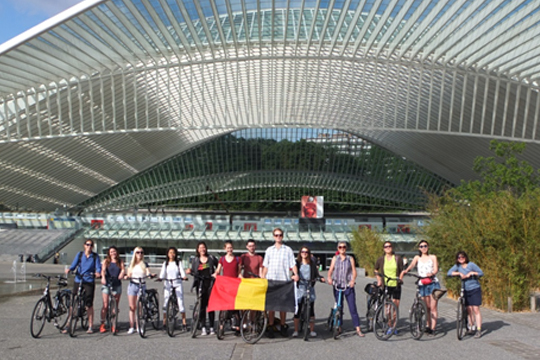 The tour group at the stunning Liège-Guillemins railway station. The next day our tour began. Having picked up our hire bicycles, we cycled through the city centre for an introduction to Liège from François Schreuer at Urbagora. This was followed by lunch and a cycling tour of the city from Julien Charlier of GRACQ Liège. 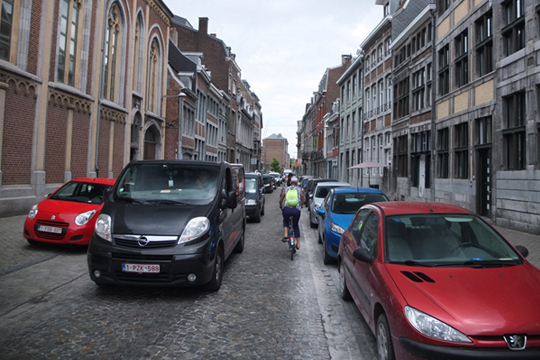 Liège is historic and often beautiful, but many of its narrow streets are filled with lines of parked and slow-moving cars. It is possible to cycle there, but it is not always comfortable. Intermittent shared-use paths are pleasant, but disappear at one-way systems and crossroads. Cycling provisions on main roads are variable and often limited to painted lanes at multi-lane intersections. While Liège has a well-developed motorway system, this has not removed traffic from its centre and cyclists often have to contend with a large number of cars. Parked cars and traffic dominate in Liège’s city centre. 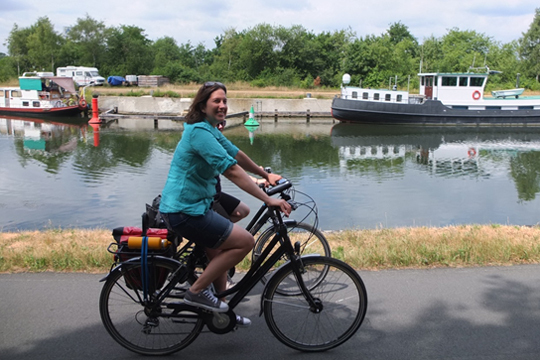 That afternoon we returned to our hotel, collected our pannier bags from reception and began the 30km cycle along the river Meuse, towards the Dutch border and our next destination, Maastricht. Crossing the Belgian/Dutch border, the quality of the cycling environment changed as though a switch had been pressed. All of a sudden cycle routes became continuous, direct and clear. Major junctions were well laid out and the overriding sense was that cycling is treated as a proper, mainstream transport choice. Arriving in Maastricht’s mediaeval centre one was struck with the bustle of life and energy; and how anyone who wants to get there by bicycle can do so with ease. Heading onwards north we stopped for lunch in the village of Bree and then left the banks of the canal, entrusting our progress to the Belgian rural cycle network. This included painted lanes on main roads and some decent shared-use paths. It was usable, but there was always the worry that the route would run out arbitrarily, leaving us stranded by a dual carriageway. Fortunately this did not happen. Crossing into the Netherlands at Valkenswaard, we once again were reunited with the Dutch and their usable well-connected cycling network. 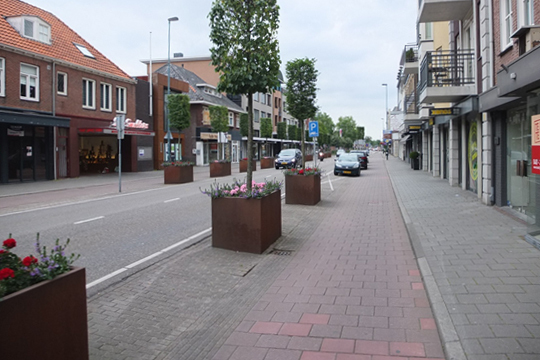 Cycle tracks and planting at Valkenswaard. Eindhoven, where we spent our final two days, is home to the electronics giant Philips and a well-known centre for industrial design. By Dutch standards it has unremarkable levels of cycling, which is to say, it has far higher levels of cycling than most other cities in the western world. The cycling environment here is so good it makes Liège look like it is hardly trying. Our tours from local academics, city planners and developers revealed that the iconic Hovenring, a giant suspended cycling roundabout, is just one feature in a massive cycle network of ‘good ordinary’ routes. These cover the entire city, including newly-developed areas such as the leafy High-Tech Campus. Want to go and visit Van Gogh’s former residence? Just hop on your bike. No special route planning needed. If you want to go there by bike, you simply do so. 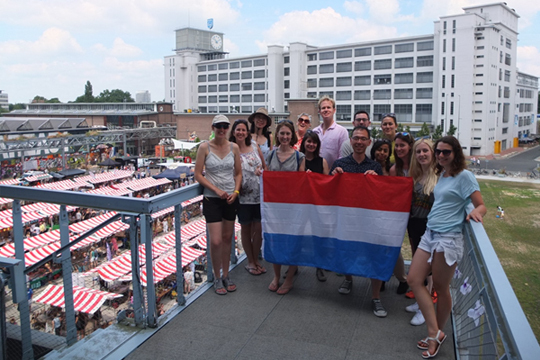 On tour in Eindhoven: former Philips factory (in background) converted for small business units. This is consistent with the approach to cycling seen throughout the Netherlands. To talk of Dutch cycling culture is slightly simplistic. Most people don’t think of themselves as “cyclists” – they simply use bikes for transport. The more significant cycling culture is a political and professional consensus that cycling is a mainstream mode of transport for everyone and not simply a nice-to-have. In my next post, I will reflect on the findings from this trip and their implications for urban design in the UK and New Zealand. ← Need help understanding Auckland’s planning rules? The Auckland Design Manual is here to help! Sounds like it was a great tour and looking forward to your findings.